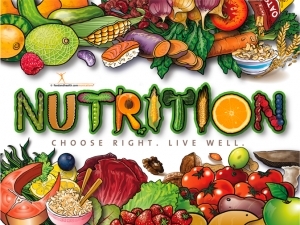 The 2019 Nutrition Education Catalog is here! It features over 50 new products along with a great winter salad recipe and handout. All of our current customers who have purchased items from us will receive one and you can download one here. It is here! The 2018 spring and summer catalog from the Nutrition Education Store is being mailed to all existing customers now. But you don’t have to wait for the mailman, you can download your copy here. Over 50 new products with timely and hot topics like fiber, microbiome, losing 10% of weight for big health benefits, and the math of movement. There are also beautiful posters of fruits and vegetables that are locally produced. Local foods are a rising trend and worth over $8 billion a year. PLUS there is a downloadable handout in the digital catalog! And there is a coupon code for 10% off and free standard shipping (48 states). Topics are selected based on the research from peer-reviewed journals, customer requests, health professional advisors, the USDA MyPlate news, the Dietary Guidelines and from the newsletters produced on our sister site, foodandhealth.com who publishes a monthly newsletter and white label nutrition newsletter for health professionals each month. Foodandhealth.com features the work of dietitian writers who provide research updates and practical insights each month from working with their clients. This think tank is an essential resource for the Nutrition Education Store because it is always up to date on all peer-reviewed research, new recommendations from public health authorities, and feedback from the author’s clients. This year we are seeing a lot of research on the microbiome which makes fiber a hot and fun topic. We created a poster called gut health and then made another one that is an infographic called the Math of Fiber. There is new research which shows that standing and reducing sitting is just as important for getting enough exercise and can add quality years to your life. Finally we have reported that local foods from local farms is gaining popularity and we are featuring a lot of materials that show their beauty. Food, especially fresh produce in season, is the art subject on our posters. One person exclaimed that the peaches remind him of his youth when he would pick and eat juicy ones from a family tree. And we have a whole selection of MyPlate plates, too. PLUS there are tons of new wall and floor decals. And prizes. In a hurry? Contact us and we will help you find what you need or prepare a quote. 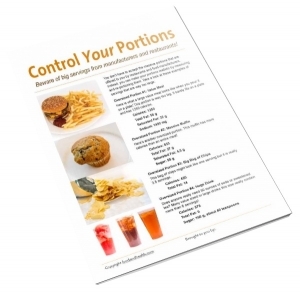 OH and our famous Nutrition Education Store catalog also features a free handout, MyFood Diary so you can help people log their daily food intake and get to a more healthful eating pattern. To see all of the new products from the catalog now, click New at the top of our site. Have you had a moment to check out the Holiday Wellness Challenge? The Holiday Wellness Challenge offers a fun way keep your clients on track during the holiday season. After all, according to a study published in the New England Journal of Medicine, Americans gain an average of .4 to 1.8 pounds each year during the holidays. With a little know-how and some fun strategies, this weight gain can be avoided. To get the details about the Holiday Wellness Challenge, check out the post Holiday Wellness Challenge over in the Food and Health blog. And for an even closer look, I want to offer a preview of one of the chapters today! Here’s the first handout from Chapter Five: Jump Start Your Breakfast. Feel free to download it and distribute as you see fit! Life is busy, and busy often ups its game during the holidays. Between parties, family projects, decorations, and shopping, something has to give. Breakfast should not be it. Breakfast offers key nutrients that will give you energy. Plus, with the right foods, you won’t get hungry on your way to holiday activities and errands. Furthermore, when you make healthful choices at breakfast, you start the day on the right foot. It’s easier to stick to good habits that way. Having breakfast every morning kick-starts your metabolism. Studies indicate that people who eat breakfast in the morning are less likely to get diabetes. 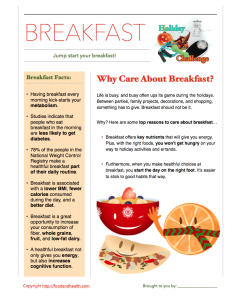 78% of the people in the National Weight Control Registry make a healthful breakfast part of their daily routine. Breakfast is associated with a lower BMI, fewer calories consumed during the day, and a better diet. Breakfast is a great opportunity to increase your consumption of fiber, whole grains, fruit, and low-fat dairy. A healthful breakfast not only gives you energy, but also increases cognitive function. 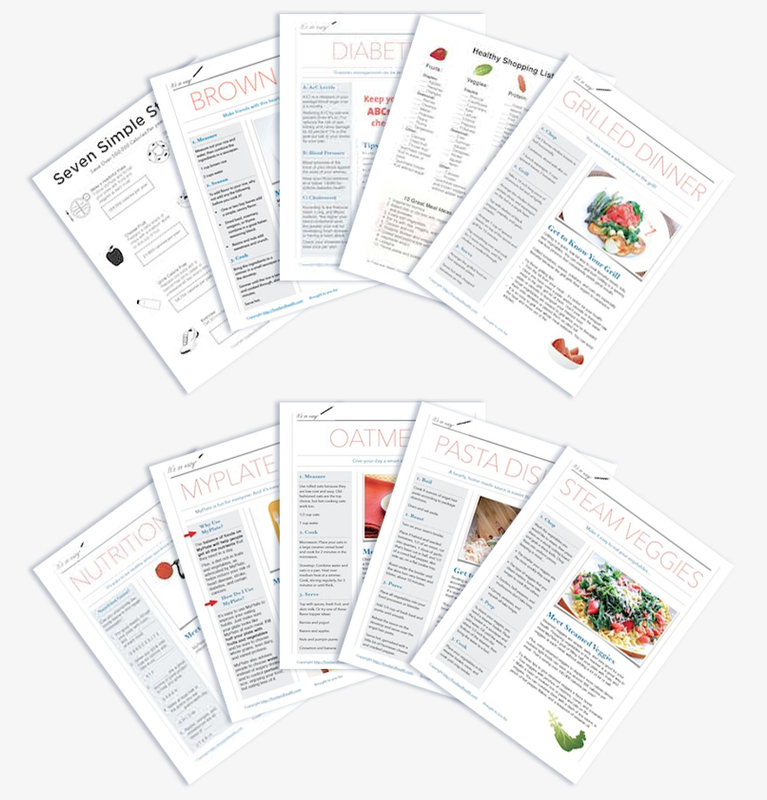 Could you use a few more nutrition education handouts in your repertoire? 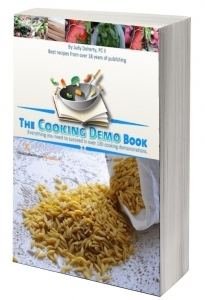 Are you looking for ways to help your clients learn how to cook healthfully? Would you like to take a fresh look at key health topics? If you answered “yes” to any of the questions above (and honestly, even if you didn’t), then you’ll love this post! Why? Because today we’re announcing the start of a new free nutrition handout program. For absolutely no cost, you can download 10 brand-new handouts and distribute them as you see fit! Each handout divides the preparation process into 3 easy steps and offers a discussion about why these foods are good for health. Of course, that’s not all! There are 5 other free handouts that you can download in the same program. 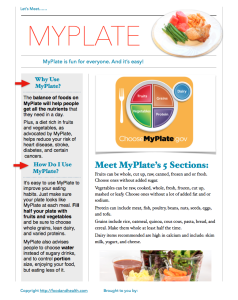 The first of the remaining nutrition handouts is all about MyPlate. 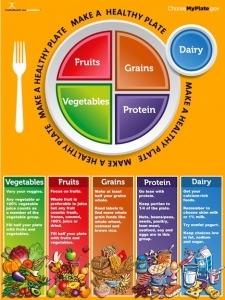 It covers all 5 food groups, as well as the reasons why people can use MyPlate for good health. 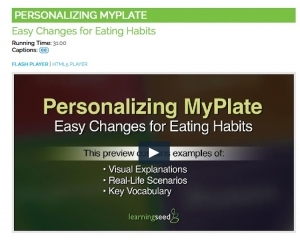 It even reviews strategies for getting started with MyPlate. 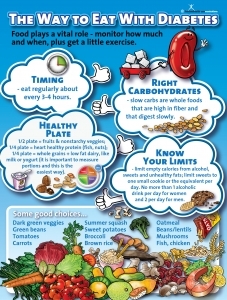 This free MyPlate handout is versatile, colorful, and packed with great advice. There’s also a free version of our popular 7 Simple Steps handout. 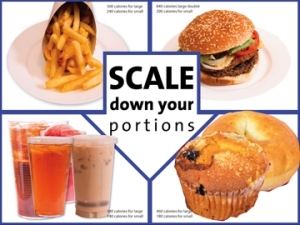 This great guide offers 7 ways that people can reduce their calorie intake. 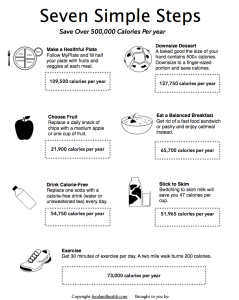 Each step is simple and supported by calculations of just how many calories a person would save/burn by following that advice over the course of a year. That’s not all! We made a guide to healthful shopping too! 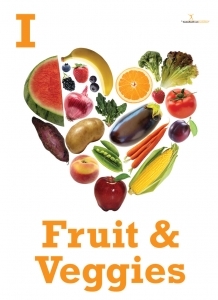 This handout has a list of key foods for good health and a balanced diet. Then it takes things to the next level with a list of 10 simple meal ideas. Your clients will love this one! Of course, we don’t stop there! 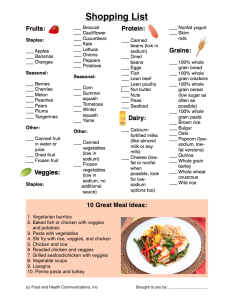 Check out this wonderful nutrition handout that’s just for kids! 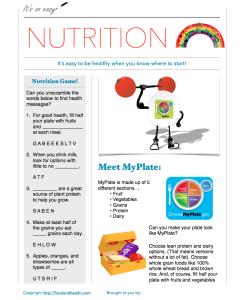 This page simplifies the key messages of MyPlate and uses fun games and word scrambles to make key points. What a great way to make learning fun! And finally, last but certainly not least, is a free diabetes handout. 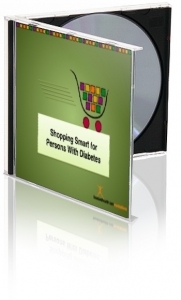 Communicate the key messages of successfully managing diabetes with a single simple handout. 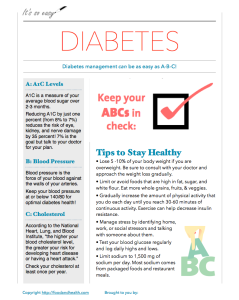 This page covers A1C levels, blood pressure, cholesterol, and a guide to living healthfully with diabetes. What’s not to love? So, 10 great handouts, all for free! What do you say? Get more information or download the handouts today! 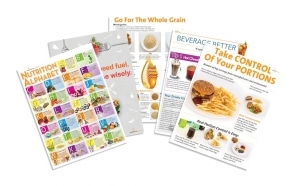 Plus, there are tons of great handouts in the Nutrition Education Store. Check out these popular options! 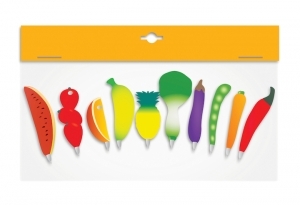 Today I want to bring you a special treat from the Nutrition Education Store! This Muscle vs. 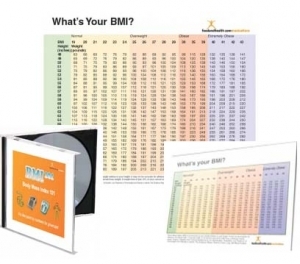 Fat poster is one of our top-selling resources, popular with a wide range of health educators. Since all of the posters we make come with a handout, now I’d like to share the handout that comes with this popular poster, for free! I hope you like it! Weight is weight, right? Does what makes up the weight actually make a difference? 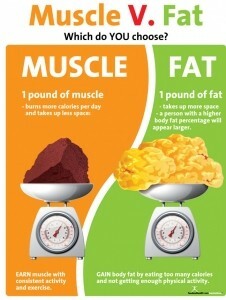 Surely a pound of muscle is the same as a pound of fat, right? What makes up the weight you carry can have an impact on your health, appearance, physical abilities, and general well-being. Muscle and fat could not be more different in terms of both structure and role. Some muscles attach to your skeletal system. Others are key to the circulatory and digestive systems. Your heart is a muscle, and so is your bicep. Muscles are vital to the way your body runs! 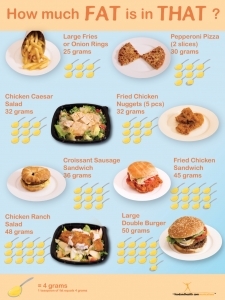 Muscles use up calories in order to function, and they generally use up more calories than fat does (1). According to a paper published in the Exercise and Sport Sciences Review, “exercise improves the capacity of muscle to oxidize fat” (2). Since “reduced rates of fat oxidation […] have been shown to predict weight gain” (2), regular exercise can give muscles a boost in their fat oxidation, making it easier for you to control your weight. 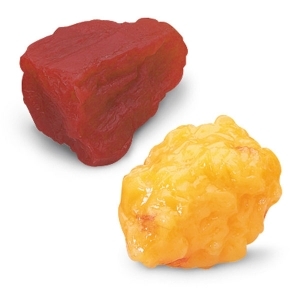 Muscle is also denser than fat, which means that a pound of it will take up less space than a pound of fat. This can impact your physical appearance. Your body does need some fat, but it doesn’t need a ton of it. Fat helps store energy, insulate organs, and can even help the messenger systems in your body function. It also stores some nutrients, like vitamins A, D, E, and K.
Fat doesn’t use up as many calories as muscle does. Meanwhile, fat cells store more calories than muscle cells do (1). In terms of appearance, a person with a higher body fat percentage will appear larger than a person with a lower percentage, even though they weigh the same. 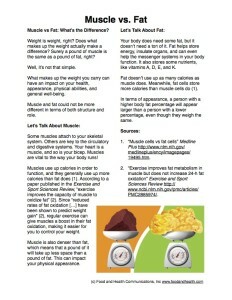 “Muscle cells vs fat cells” Medline Plus http://www.nlm.nih.gov/medlineplus/ency/imagepages/19495.htm. “Exercise improves fat metabolism in muscle but does not increase 24-h fat oxidation” Exercise and Sport Sciences Review http://www.ncbi.nlm.nih.gov/pmc/articles/PMC2885974/. Like what you see? Here’s the handout, for free! How will you use your copy? What should I do with 10 pounds of carrots? The short answer is because I’m frugal. Carrots were on my grocery list; I use carrots frequently and consider them a vegetable staple. I can’t bear to spend $1 to $1.50 for a pound of carrots at the grocery store when I can get 10 pounds at our big box store for about $6. That’s just $.60 cents a pound — half the price, but a whole lot of carrots. This large amount of carrots does cause a bit of a problem. Can I use them up while they’re still fresh? Yes, I admit that there is a certain level of convenience in the bagged, ready-to-eat carrots. It’s no surprise that baby carrots are among the most popular items in the produce aisle, accounting for over 80% of all retail carrot sales. 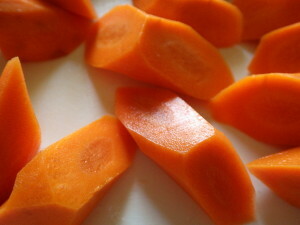 One pound of carrots equals 3 to 3½ cups of peeled and sliced, chopped, or grated raw carrots. 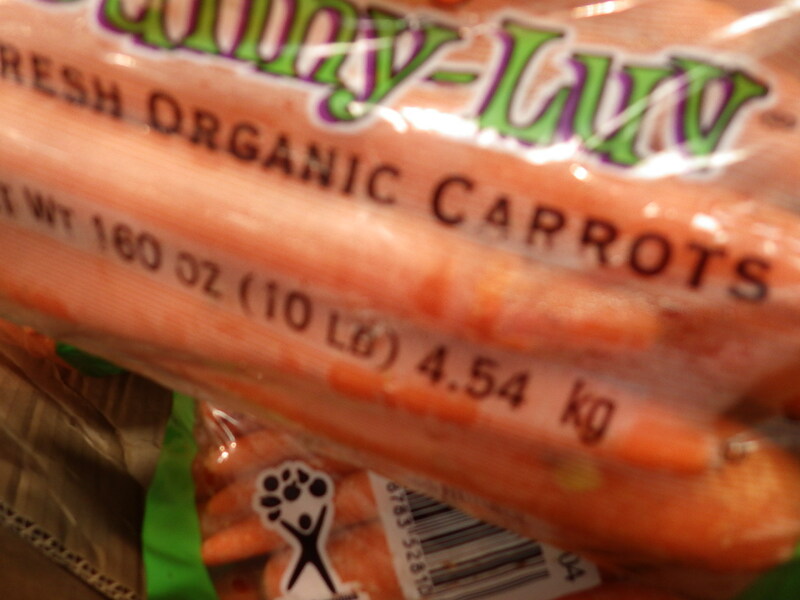 In case you’re counting, one 7-inch-long carrot has only 30 calories. A single cup of grated carrots has 45 calories. And boy, there are lots of nutrients packed into those calories! Few other vegetables or fruits contain as much carotene as carrots, which the body converts to vitamin A. Carrots are also a good source of potassium, fiber, and vitamin C.
But now, back to my 10 pounds of carrots. Storage of this many carrots can pose a conundrum. 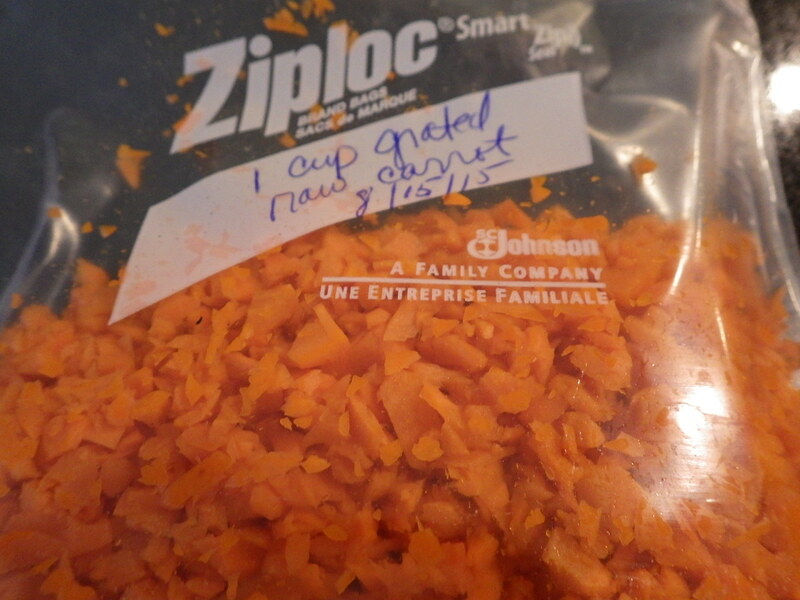 It’s best to store carrots in a plastic bag in the refrigerator, unwashed and uncut, until you’re ready to use them. Most references say that carrots will keep for at least two weeks this way. However, I think we’re more inclined to eat our vegetables if they’re ready to use — that’s why baby carrots and pre-cut carrots are so popular (and $2 a pound!). So I left some carrots uncut and sliced some others for easy snacking on the go. To use up my bounty, I turned to the Food and Health Communications recipe files. If you’re ever in the same boat as me, may I recommend the following recipes? They’re great for carrots! Anyway, I’ve done this before, and after a while my husband finally said, enough is enough, he can’t eat any more carrots. Which is fine, but what do I do with the few that are lingering in the crisper drawer? The answer: I chop or grate them and throw them in the freezer in 1 cup portions. The National Center for Home Food Preservation says that carrots should be blanched before freezing for the best quality and texture. Since I plan to use the frozen carrots in cooked foods, I don’t worry too much about this, but I do try to use them up sooner rather than later. I actually like to have this extra stash in the freezer, ready to go for soups and casseroles when I don’t have fresh carrots available. I’ve said this many times, a bargain isn’t a bargain if some of it goes to waste. But, in this case, I keep trying to convince myself that even losing a few last carrots would be cheaper than buying fewer at the $1.50 per pound price. I think I’m still ahead financially, but I admit, I had to work at it! 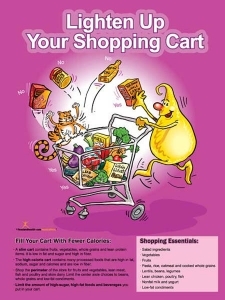 Here are a few more cooking and shopping resources from the Nutrition Education Store. We’re here to help you look your very best, right now. And here’s a handout that offers a great introduction to carrots, including their nutrient profile, how to cook with them, and how to store them. Enjoy! 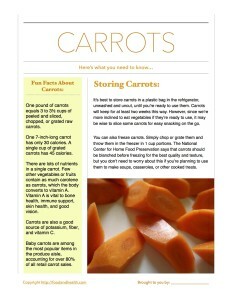 Sharol Cripe, RDN, LDN, has also sent in a fantastic carrot resource. Visit the Englewood Farmers’ Market homepage to see recipes for roasted carrots and carrots with a Moroccan twist! You all know how much I love getting requests, right? Here’s a fun request that made its way into my inbox a few weeks ago. Each year, I sponsor a “poster project” at my daughter’s school. Students in grades pre-school thru 2nd grade are given a page to color. 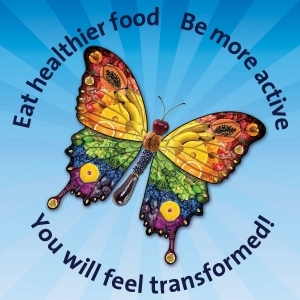 I use the one available from the Academy of Nutrition & Dietetics website, based on the year’s theme. However, they have not created a page this year. Last year, you were able to create 2 pages. 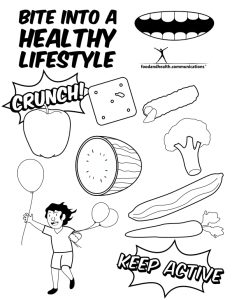 I am wondering if you might have a page that I could print for the students to color, based on the theme, “Bite into a Healthy Lifestyle”? My team and I immediately went to work, and Mary Therese Maslanka had those coloring pages in her inbox as soon as we were done. But I didn’t want to stop there. Now that it’s National Nutrition Month, what better time to share this wonderful resource with you, dear readers? 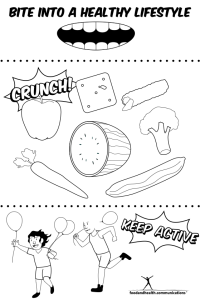 So, without further ado, here are two great coloring pages that are based on this year’s theme: Bite Into a Healthy Lifestyle. Get your copies today! 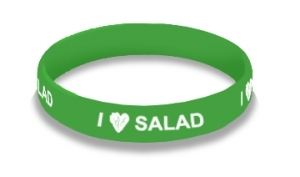 Looking for more fun ways to get kids involved with National Nutrition Month? Check out these fun games and prizes! The options are many. Do you want large eggs or medium? Are some really more nutritious than others? Or what about the low-cholesterol egg substitutes? Choices, choices, choices. I spoke with representatives from both the American Egg Board and the Ohio Poultry Association, and they helped me answer some of these questions. Together, we sorted through the misinformation, myths, and personal anecdotes about eggs. Due to changes in farming and feeding, today’s eggs contain more vitamin D and are lower in cholesterol than before. 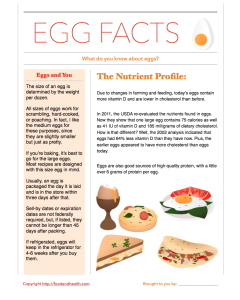 In 2011, the USDA re-evaluated the nutrients found in eggs. Now they show that one large egg contains 75 calories as well as 41 IU of vitamin D (64% more than in the 2002 data analysis) and 185 milligrams of dietary cholesterol (this is down from the earlier level of 220 milligrams.) Eggs are good sources (a little over 6 grams) of high-quality protein. In an effort to reduce cholesterol, calories, and fat, some people are using just egg whites. This can be done by separating the whites from the yolks once you crack an egg open. You can also buy an egg substitute. 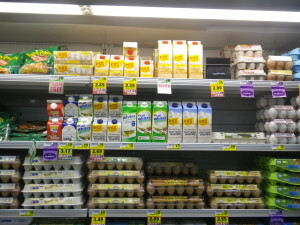 Some egg products come in milk carton-style packages and are just egg whites. Others contain added ingredients that make them look and taste like whole eggs. But think about what you really want from these options. Yes, all of the fat and cholesterol in an egg can be found in the yolk, and of the 75 calories in a large egg, 54 of them come from the yolk. But remember that the yolk is a good source of vitamin D and two carotenoids — lutein and zeaxanthin. 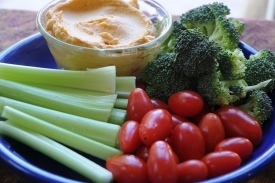 These carotenoids help protect against macular degeneration as we age. Usually, an egg is packaged the day it is laid and is in the store within three days after that. The date the egg is packed is provided on the carton in the “Julian date”. This is a three-digit code for the day of the year. For example February 1 would be 032 and December 31 would be 365. * Sell-by dates or expiration dates are not federally required, but, if listed, they cannot be longer than 45 days after packing. If refrigerated, eggs will keep in the refrigerator for 4-6 weeks after you buy them, which is right about 5 weeks. I go into more detail about this in the post How Old is that Egg? The size of an egg is determined by the weight per dozen. All sizes of eggs work for scrambling, hard-cooked, or poaching. 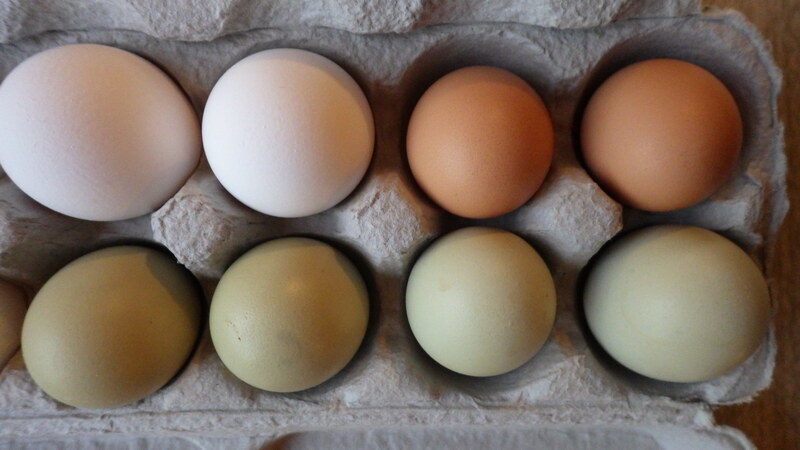 In fact, I like the medium eggs for these purposes, since they are slightly smaller but just as pretty. If you’re baking, it’s best to go for the large eggs. Most recipes are designed with this size egg in mind. Now, what about those eggs that claim to be higher in certain nutrients or lower in cholesterol? If a product label indicates a nutrient difference from the standard, then these claims need to be documented through research. Yes, it is possible to slightly alter the nutrients in the eggs through the chicken’s feed. For example: if a chicken is fed food that is high in flax seed, then the resulting eggs can be higher in vitamin D. But, you’re going to pay for a higher price for these eggs due to the higher cost of the feed. Whether you buy eggs with more vitamin D is a personal choice. The same goes for organic, free-range and cage-free eggs. The USDA nutrient analysis shows that these eggs are all nutritionally the same as traditionally farmed eggs, but the circumstances in which the chickens are kept may vary. Even though it makes shopping more difficult, I think we’re lucky to have all of these choices. Which eggs will you pick? *Except on a leap year, of course! Want to help your clients become smart consumers? 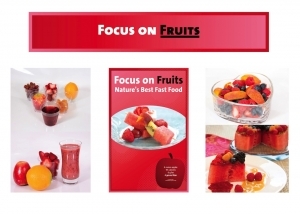 Try some of these great new products from the Nutrition Education Store! Thank you for scrolling! Here’s a free egg handout — I hope you enjoy it! Marketed to improve energy, promote weight loss, increase stamina, and boost athletic performance/mental concentration, energy drink sales are expected to reach $52 billion by 2016. Energy drinks are most popular with teens and young adults — 30-50% of them frequently consume energy drinks. Energy drinks start off with a combination of sugar or sugar substitutes and caffeine. Then herbal extracts like ginseng, guarana, yohimbine, and ginko biloba are added. There also might be amino acids, taurine, L-carnitine, or B vitamins too. Although the Food and Drug Administration (FDA) limits caffeine content in soft drinks, there is no regulation of energy drinks, which are classified as dietary supplements. Many energy drinks contain 70-80 milligrams (mg) of caffeine per 8 ounces, which is three times the amount of caffeine in cola drinks. Since many energy drinks are packaged in containers that hold 12 ounces or more, the amount of caffeine can easily reach 200 mg or greater. 200-300 mg of caffeine per day is considered a safe amount for adults, and the American Academy of Pediatrics states that energy drinks are never appropriate for children and teens. Manufacturers are not required to list the caffeine content from additives, which means that the actual caffeine content can exceed what is listed on the label – if it’s listed at all. Plus, with 220-260 calories per 16-oz serving (that’s equal to 13-16 teaspoons of sugar), energy drinks also contain more sugar and calories than carbonated cola beverages. 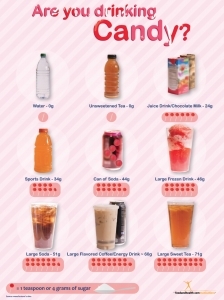 Sweetened beverages are a primary source of sugar in our diet, and they contribute to obesity and dental caries. Should I Drink Energy Drinks? I recommend that you skip energy drinks and instead choose beverages that promote health and hydration. Think water, fat-free milk, and 100% fruit juice. For optimum energy, eat a balanced diet, get plenty of sleep, and participate in regular physical activity. The History of Energy Drinks: A Look Back. Wall Street Insanity. Samantha Lile. 5-6-2013. http://wallstreetinsanity.com/the-history-of-energy-drinks-a-look-back/ Accessed 5-21-14. Caffeine in the Diet. MedLine Plus. http://www.nlm.nih.gov/medlineplus/ency/article/002445.htm Updated 4-20-2013. Accessed 5-21-14. Proposed Actions for the US Food and Drug Administration to Implement to Minimize Adverse Effects Associated With Energy Drink Consumption. Thorlton J, Colby DA, Devine P. Am J Public Health. 2014 May 15. 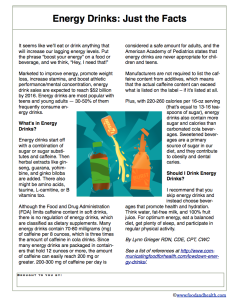 Health Effects of Energy Drinks on Children, Adolescents, and Young Adults. Seifert, Schaechter, Hershorin, Lipshultz. Pediatrics. Mar 2011; 127(3): 511–528. Clinical Report – Sports Drinks and Energy Drinks for Children and Adolescents: Are They Appropriate? Committee on Nutrition and the Council on Sports Medicine and Fitness. Pediatrics 2011 Jun;127(6):1182-9. Here’s a link to the free handout. Download it anytime! 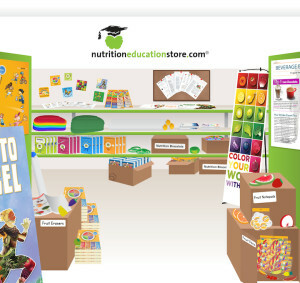 The Nutrition Education Store is always evolving. 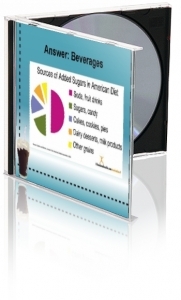 Check out the latest resources for beverages and health! I often wonder when I see people at the grocery store thumping on watermelons. Do they really know what they are listening for? A good watermelon should sound hollow… like if you thumped your chest. If it sounds like you’re hitting your head… it’s not ripe. If it sounds like thumping on your stomach… it’s definitely too ripe. Now I’ve given this saying some thought, and I’m not sure that I could judge any of those sounds. There has to be a better way to evaluate these fruits. I did some research, consulted with some colleagues, and have returned with a fun quiz that offers insight into how to select, store, and prepare watermelon. 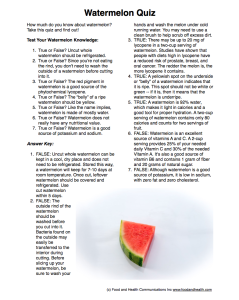 Of course, I’ve also included information about a watermelon’s nutrient content and health benefits. What better way to celebrate National Watermelon Day? The quiz is available in the text of this blog, and an abridged version is also available as a downloadable handout! So check out the options below and, if you like what you see, get the handout for free! See the yellow “belly” on that watermelon? How much do you know about watermelon? Take this quiz and find out! True or False? Uncut whole watermelon should be refrigerated. True or False? Since you’re not eating the rind, you don’t need to wash the outside of a watermelon before cutting into it. True or False? The red pigment in watermelon is a good source of the phytochemical lycopene. True or False? The “belly” of a ripe watermelon should be yellow. True or False? Like the name implies, watermelon is made of mostly water. True or False? Watermelon does not really have any nutritional value. True or False? Watermelon is a good source of potassium and sodium. True or False? The rind of a watermelon should not be eaten. True or False? It’s okay to swallow watermelon seeds. True or False? The “hollow” heart sometimes found inside a watermelon is caused by someone dropping the melon. True or False? Watermelon is a cousin to cucumbers and squash. True or False? A good way to tell if a watermelon is ripe is by giving it a good thump. FALSE: Uncut whole watermelon can be kept in a cool, dry place and does not need to be refrigerated. Stored this way, a watermelon will keep for 7-10 days at room temperature. Once cut, leftover watermelon should be covered and refrigerated. Be cautious of purchasing cut melons at farmer’s markets if they have not been kept cool after cutting. Use cut watermelon within 5 days. FALSE: The outside rind of the watermelon should be washed before you cut into it. Bacteria found on the outside may easily be transferred to the interior during cutting. Before slicing up your watermelon, be sure to wash your hands and wash the melon under cold running water. You may need to use a clean brush to help scrub off excess dirt. TRUE: There may be up to 20 mg of lycopene in a two-cup serving of watermelon. Studies have shown that people with diets high in lycopene have a reduced risk of prostate, breast, and oral cancer. The redder the melon is, the more lycopene it contains. TRUE: A yellowish spot on the underside or “belly” of a watermelon indicates that it is ripe. 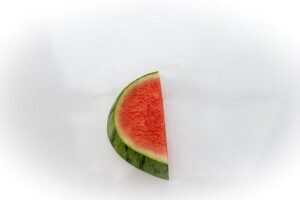 This spot should not be white or green — if it is, then it means that the watermelon is underripe. TRUE: A watermelon is 92% water, which makes it light in calories and a good tool for proper hydration. A two-cup serving of watermelon contains only 80 calories and counts for two servings of fruit. FALSE: Watermelon is an excellent source of vitamins A and C. A 2-cup serving provides 25% of your needed daily Vitamin C and 30% of the needed Vitamin A. It’s also a good source of vitamin B6 and contains 1 gram of fiber and 20 grams of natural sugar. FALSE: Although watermelon is a good source of potassium, it is low in sodium, with zero fat and zero cholesterol. FALSE: Watermelon rind is edible and can even be delicious. 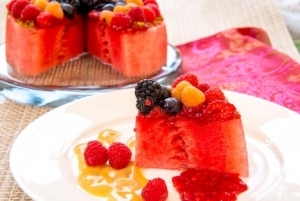 There are a variety of recipes available for items made with watermelon rind. Try using it in everything from slaw to chutney to pickles. TRUE: Despite what you may have heard when you were growing up, watermelon seeds will not grow in your stomach. It will not harm you to swallow watermelon seeds. Some people even save them, dry them, and eat them as a snack. 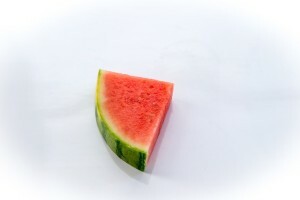 The small white seed coats that are often found in “seedless” watermelons are seeds that have not matured. These “seeds” are sterile and, if planted, will not produce a watermelon. FALSE: The “broken heart,” “hollow heart,” or cracked center that is sometimes found inside a watermelon is caused by weather conditions during the growing season. This flesh is still good and safe to eat. Some folks say watermelon with a these internal cracks are sweeter due to concentration of the sugars. TRUE: Watermelon are a vine crop and must have honeybees pollinate the blossoms. Watermelon is in the same botanical family as cucumber, pumpkins, and squash. Seedless watermelons are created by crossing different kinds of melons and are not genetically modified. 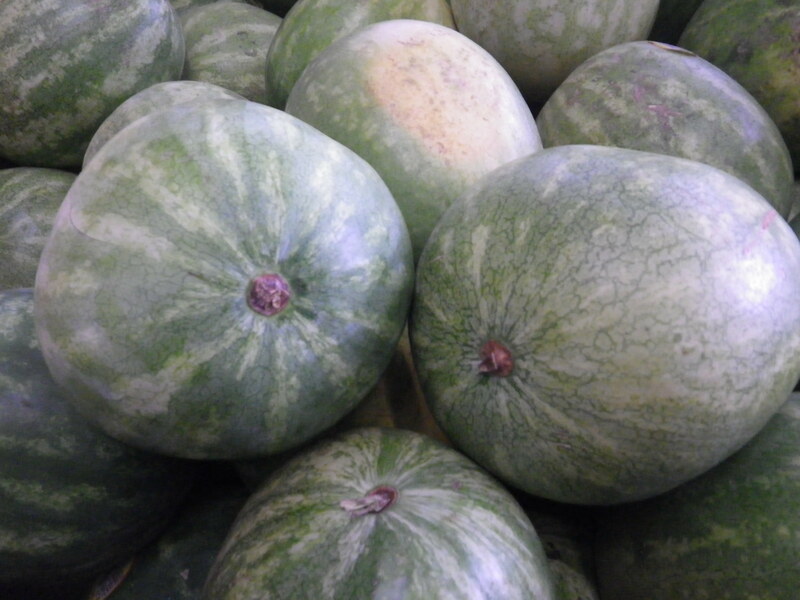 There are many varieties of watermelons available and options include: seeded, seedless, mini, yellow, and orange. FALSE: Unless you are a very experienced watermelon picker, it is difficult to tell if a watermelon is ripe solely by evaluating the sound you make when thumping on it. A good watermelon should be symmetrical, heavy for its size, and firm. It should have no cuts, dents, or bruises. Also, look for a pale or buttery yellow “belly” and a dry stem end near the base of the fruit. Want to send this quiz to your clients? You can download it here! Check out other nutrition education resources too!